Denuclearization of war weapon ! 戰爭武器 非核化를 ! [평화통일]보다도, [자유통일]을 잊지 말아야! Voice of anticommunistic national flag!! Homo homini lupus est ! 사람을 잡아먹는 것은 시랑이 떼가 아니라, 바로, 사람들이다! - Before using any kind of nuclear bombardement against each other, it will be much better for you both of side, all the nuclearzed countries, to chose of economic bombs than that of nuclear bomb ! Veritas semper universalis et concreta, justitiaque in libertate ! [평화통일]보다도 [자유통일]을 잊지 말아야!!! 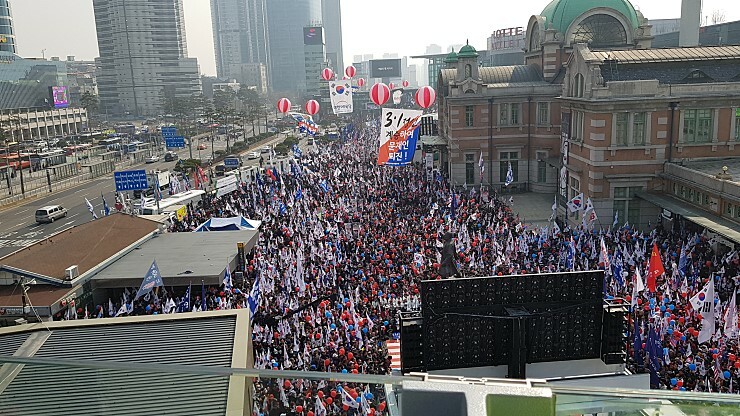 2019.03.01m 3.1 절을 기하여, 서울에 집결한 태극기들 ! 서울역 태극기 정말 대단한 오늘이었다! !족히 10만이 넘는 인원들이 참석하였음! !말로 설명이 안되는 웅장한 장관들이 연출되었다!! 설명이 필요없다. 교황 비오 11세 성하의,[聖 프란치스꼬 살레시오 주교 서거 300 주년(1622~1922) 기념 칙서]. <1923년 1월 26일 발표> RERUM OMNIUM PERTURBATIONEM. 교황 바오로 6세 성하의, [聖 프란치스꼬 살레시오 주교 탄생 400 주년(1567~1967) 기념 칙서]. <1967년 1월 29일 발표> SABAUDIAE GEMMA. 이상 2 칙서의 Latina 원문과, Italiano 번역문 이하. 본 Wind Bell (풍경소리)에서 전문 볼 수 있읍니다. 1953년, 3월 국민학교 졸업 후, 65년 만(2018.10.12)에 처음 만나는 80대의 변기영 몬시뇰 동창생들, 용인군 남사국민학교 제16회 졸업생들이 참으로 반세기가 넘는 세월을 보내고 이제서야 그래도 이렇게 만나게 되네 그려!. 모두들 아직 살아 있었네 그려 ! 통일의 내용과 본질이 자유가 보장된 자유민주화 통일이라야 한다 !!! 따로 무관하게 있을 수가 없다. 세계 전 인류의 생사와 존망의 공동문제가 아닌가 !? 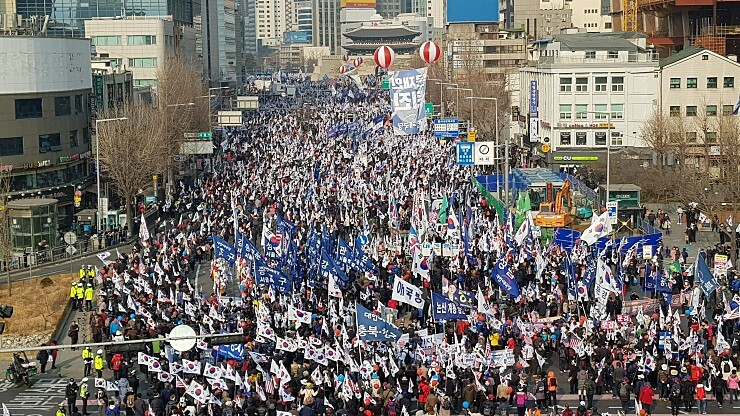 2018년 4월 1일,예수님 부활 대축일을 경축하면서, 금년에 우리나라의 평화통일이 이루어지도록 기도합시다. 다만, 결코, 平和統一이 無償으로는 불가능하다는 것을 잊지 맙시다.공짜로 받는 無償 平和統一은 자력, 자립, 자치의 역활이 배제된 것으로, 점령이나 정복이 전제된 속국이나 예속이나 모방의 흡수나 합방에 불과한 것입니다. 善은 平和의 母親이고,眞理는 正義의 父親이다.그래서 善과 平和는 母女 關係이고,眞實과 正義는 父子 關係다.그러므로 善하지 못한 사람이 平和를 줄 수 없으며,眞實하지 못한 사람이 正義로울 수는 없다.자신에게 없는 것을 남에게 줄 수 없기 때문이다.-卞基榮 몬시뇰. 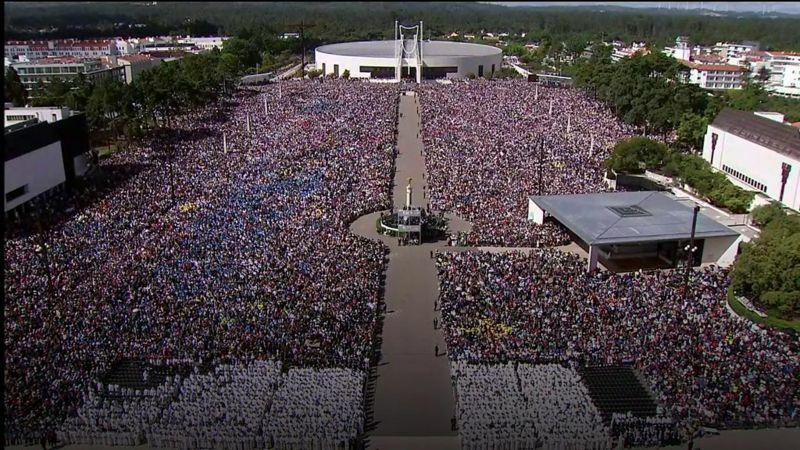 Pope makes saints of shepherd children/ 2017/05/13, Holy Father Francesco canonized 2 seers children,Giach Photos from BBC.Canonization Mass of 2 childrean in Fatima, Portugal/from Avvenire.it< 2017. 5. 13. >Hyachintha and Francesco in 100 anniversary Holy Mass of the Holy Mary's apparation for 6 Monthes ! Denuclearization movement of war weapon !!! 人類 破滅의 戰爭武器 非核化運動은 오늘날 우리 全 人類의 共同 最大 急先務다! 經濟發展만이 國家存立의 唯一한 目的은 아니다. 領土擴張 위해 他國占領과 破壞와 他國民 大量殺傷은 過去史에서나 있었던 强大國들의 猛獸的인 存在方式이며 目的이었다. 1970年代初에, 美國의 레이건 大統領 主導로 全 世界 核武器 縮小 決意에 따라, 韓半島의 非核化를 위하여, 南韓에 配置되었던 戰術核들이 모두 撤收 除去되었다. 그 後, 非核化 상태에 있던 北韓의 核武裝과 長距離 미사일 製造 保有로, 現在 韓半島의 非核化는 사라지고, 오히려 列强들의 新武器, 특히 美國의 戰略資産 韓半島 集結과 大規模 韓美 合同 綜合軍事訓鍊이 繼續되고 있다. 國民福祉는 고사하고, 國家 經濟가 어려워,매년 食糧과 保健 醫療, 등을 外國 援助에 의존하는 北韓의 核武裝과 大陸間 長距離 미사일 製造 保有는 蘇聯의 技術支援과 中國의 經濟 後援없이는 不可能하였으리라고 생각된다. 北韓核이 解決되어 韓半島의 非核化가 되지 않으면, 日本의 核武裝 豫防이 不可能하고, 나아가서, 中國의 核武裝 解除가 더 極難해지며, 美.蘇와 全 世界 各國의 核武器 完全 除去역시 不可能해지므로, 人類는 共同自滅의 길로 갈 수밖에 없다. 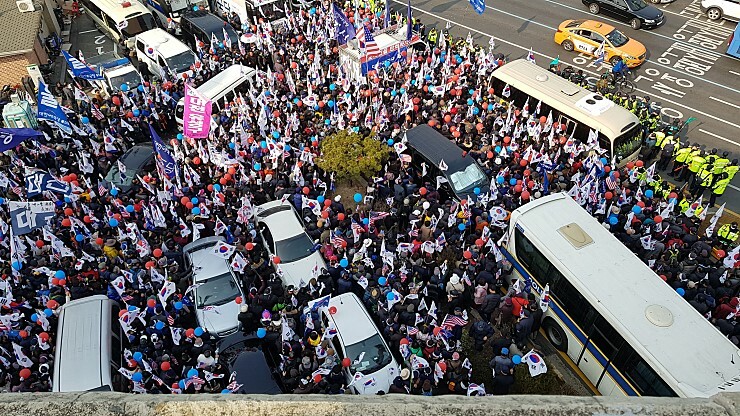 결국 北韓核은 南北韓만의 問題가 아니라, 全 世界 人類 全體의 時急한 當面課題다. 不幸하게도 韓半島에서 核戰爭이 勃發하면, 極東 亞細亞 大戰이 不可避하며, 第三次 世界 核大戰으로 擴大될 수 밖에 없다. 人類의 核戰爭 出發 舞臺가 되는 韓.中.日이 于先은 最大의 被害國 으로서, 政權도, 國民도, 文化도, 文明도, 歷史도 모두 사라지게 될 것이다. 그러므로, 雙方 어느 편이든지, 核武器, 특히 核爆彈을 비롯한 人類 大量殺傷武器인 生化學 武器, 等을 使用하기 前에, 먼저 經濟爆彈 使用으로, 核戰爭 豫防이 어느정도 可能할 수 있습니다 人類의 武器 非核化를 위하여, 眞理와 正義와 自由를 지키고 아끼고 가꾸는 모든이가 娛樂과 遊興과 奢侈와 享樂을 멀리하고, 특히, 信仰人들은 聖母 Maria님과 함께, 一心同體가 되어, 每日 天主님께 祈禱해야 한다 ! Homo homini lupus est ! 사람을 잡아먹는 것은 시랑이 떼가 아니라, 바로, 사람들이다! Veritas semper universalis et concreta, justitiaque in libertate ! 眞理와 正義와 自由는 恆常 어디서나 普遍的이며 具體的이다 ! 自由가 없는 곳에, 自由가 없는 사람에게, 眞實과 正義가 있을 수 없다. 自由不在 社會나, 自由不在 言論 團體나, 그러한 組織體에 얽매어서 自由가 없는 사람들의 마음과 말과 글에는, 眞實이 있을 수 없고, 正義도 있을 수 없으며, 虛僞造作 宣傳과 宣動만이 있게 마련이다. 오늘의 대한민국 국민 모두는 나라와 교회를 위하여, 知識人과 宗敎人이 되기 전에, 政治人이나, 司法人이나, 敎育人이 되기 전에, 먼저 [人間]이 되어야, [眞率하고 正直한 人間이 되어야만], 굳세고 바르게 正道를 걸어가며, 이 시대의 외침이 될 수 있을 것이다! 우리 모두 天主님을 위한 信仰의 殉敎者, 人類社會를 위한 正義의 勇士, 어디서나 언제나 眞理의 宣言者가 되어야 한다. Before using any kind of nuclear bombardement against each other, it will be much better for you both of side, all the nuclearzed countries, to chose of economic bombs than that of nuclear bomb ! They must keep to stand in denuclearization of war weapon, and, not using anykind of chemical, nor biological weapons. No one of the both US Army(including UN Army) and Red China Army also have to across over Yalu River(Am nock-Kang), and, nor Dooman-kang, where is a starting field not only of the new Extreme Asian war, but also, of the 3rd world war of nuclear weapon, which can be extended immediately and quickly soon in progress ! It can not but be the 3rd world war by nuclear weapon ! Never, it can be an war of only Korean peninsula ! It is very urgently necessary universal Church's movement to devote ourselves to pray with Our Holy Mary, Mother of God, Mother of Christ, Mother of the Church, Mother of all the faithfuls, and, Regina Mundi to the almithy God ! Particularily, China of today have to take an one step backward, then, two steps forward, in this warlike situation against the US & against the UN ! All, we, catholics today should be martyrs of freedom, warriors of justice, and, speakers of truth ! How many times, were these repeated by Msgr. 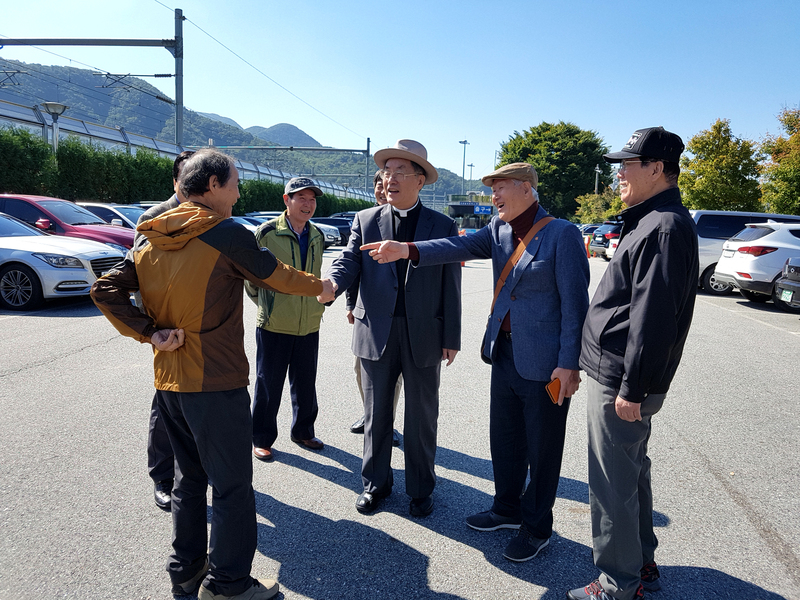 Peter Byon without interruption in the voice of Chon Jin Am for 1995~2017 upto now to all the leaderslike leaders of today for denuclearization of war ! It's an infinite glorious opportunity if we can be martyred for the people's freedom, being warriors for human justice, and, speaking the truth of our Catholic Church of Christ ! Voice of www.msgrpeterbyon.org today ! www.변기영몬시뇰사랑방.kr 에서 외치는 소리! 1984년 5월 6일, 서울, 여의도 5.16 광장에서 거행된 한국순교복자 103위의 시성식 광경. 당시 언론과 보도기관에서는 100만여명으로 보도하였으나, 필자(Rev. Peter Byon)는 55만명~60여만명으로, 내한한 성청 인사들에게 보고 하였었다. (Sua Santita Giovanni Paolo II aveva concelebrato la messa per la canonizzazione dei 103 Beati martiri coreani, con molti Cardinali, Arcivescovi, Vescovi, sacerdoti e fedeli cattolici - circa 500.000 - a Seoul il 6 maggio 1984. Per quella canonizazione, il Rev. Byon, rettore di Chon Jin Am, il luogo natale della Chiesa, aveva servito per 5 anni (1980~1984) come segretario esecutivo generale della commissione episcopale per la canonizzazione dei 103 Beati Martiri coreani.>(Photos by Baeck-Nam-Shick). Canonizzazione dei 103 Beati martiri coreani in Seoul 1984 ! 천지를 진동하는 반공의 태극기 함성 ! 2019년 1월 14일/ 제102차 서울역과 광화문 광장 태극기 집회 !천지를 진동하는 태극기의 함성! 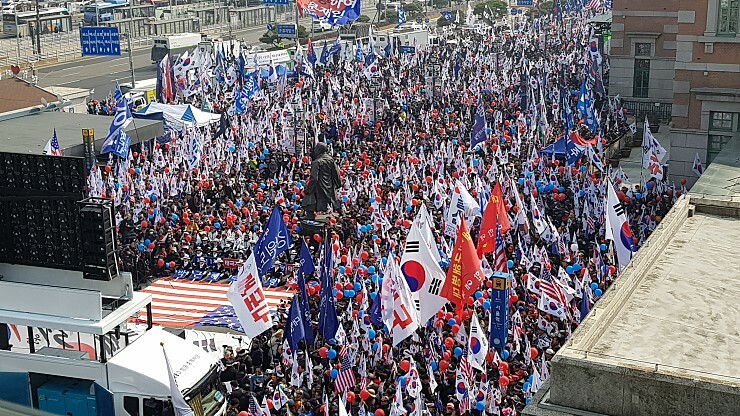 The voice of Anti-communistic Tae-Gheuck-Ki, Korean National flag in Seoul !!! 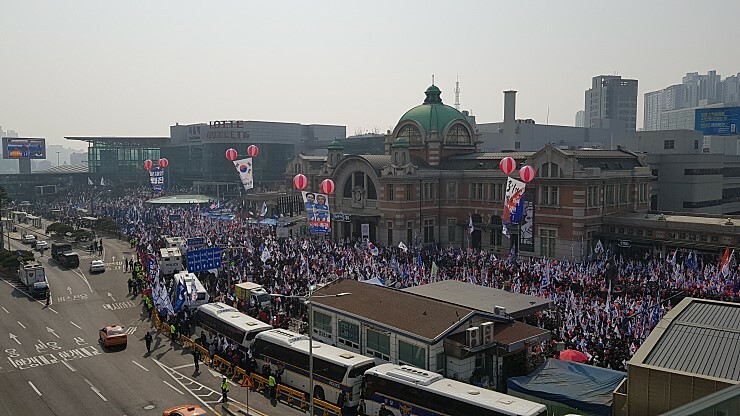 The voice of Anti-communistic Tae-Gheuck-Ki, Korean National flag in Seoul !! 1년 내내 매주 주말이면 반복 증가해도 일체 보도되지 않는 언론부재 사회인가???!! 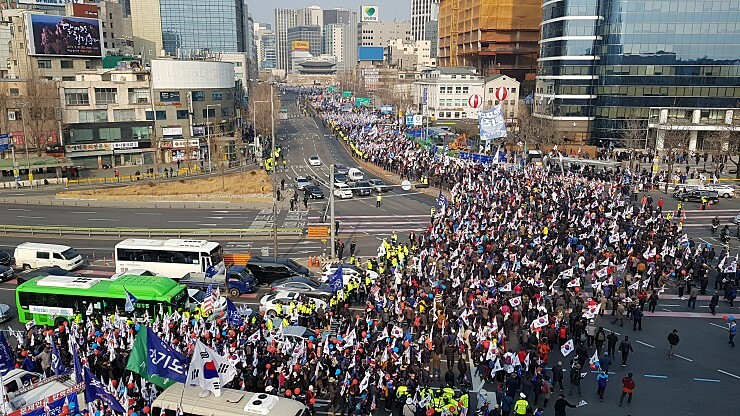 People's power with national flag, Taegheuki in main center street of Seoul Korea ! 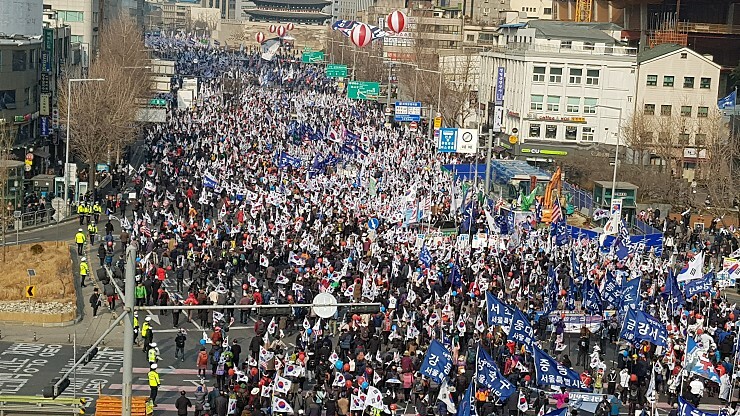 Already, they are doing the protesting celebrations for 100 times, even in so very hard cold weather 13 degree below zero during the 29~ 31 of Dec. 2018 !! 불쌍한 태극기 집회에 동정심이 생긴다! Copyright ⓒ Msgr. Byon All Rights Reserved.